Hamilton did not create America’s market economy so much as foster the cultural and legal setting in which it flourished. A capitalist society requires certain preconditions. Among other things, it must establish a rule of law through enforceable contracts; respect private property; create a trustworthy bureaucracy to arbitrate legal disputes; and offer patents and other protections to promote invention. The abysmal failure of the Articles of Confederation to provide such an atmosphere was one of Hamilton’s principal motives for promoting the Constitution. “It is known,” he wrote, “that the relaxed conduct of the state governments in regard to property and credit was one of the most serious diseases under which the body politic laboured prior to the adoption of our present constitution and was a material cause of that state of public opinion which led to its adoption.” He converted the new Constitution into a flexible instrument for creating the legal framework necessary for economic growth. He did this by activating three still amorphous clauses–the necessary-and-proper clause, the general-welfare clause, and the commerce clause–making them the basis for government activism in economics. ANNIE MURPHY PAUL. “‘Who Do You Think You Are?” The New York Times Book Review (Sun., DEC. 28, 2014): 7. Little, Brian R. Me, Myself, and Us: The Science of Personality and the Art of Well-Being. New York: PublicAffairs, 2014. (p. A15) Critics of President Obama’s “net neutrality” plan call it ObamaCare for the Internet. Utility regulation was designed to maintain the status quo, and it succeeds. This is why the railroads, Ma Bell and the local water monopoly were never known for innovation. The Internet was different because its technologies, business models and creativity were permissionless. This week Mr. Obama’s bureaucrats will give him the regulated Internet he demands. Unless Congress or the courts block Obamanet, it will be the end of the Internet as we know it. L. GORDON CROVITZ. “INFORMATION AGE; From Internet to Obamanet; BlackBerry and AT&T are already making moves that could exploit new ‘utility’ regulations.” The Wall Street Journal (Mon., Feb. 23, 2015): A15. “Rather than declining as feared, the Adélie penguin population generally is on the rise, scientists say.” Source of caption and photo: online version of the WSJ article quoted and cited below. (p. A3) For the first time, researchers have counted all the world’s Adélie penguins–a sprightly seabird considered a bellwether of climate change–and discovered that millions of them are thriving in and around Antarctica. Rather than declining as feared due to warming temperatures that altered their habitats in some areas, the Adélie population generally is on the rise, the scientists said Thursday. 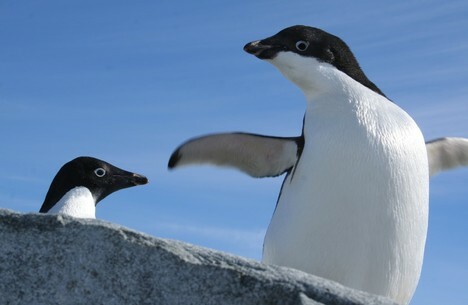 Counting the birds by satellite, Dr. Lynch and imaging specialist Michelle LaRue at the University of Minnesota found that the Adélie penguin population now numbers 3.79 million breeding pairs–about 1.1 million more pairs than 20 years ago. In all, they identified 251 penguin colonies and surveyed 41 of them for the first time, including 17 apparently new colonies. ROBERT LEE HOTZ. “Antarctic Penguins Thrive.” The Wall Street Journal (Fri., July 11, 2014): A3. (p. 344) The American Revolution and its aftermath coincided with two great transformations in the late eighteenth century. In the political sphere, there had been a repudiation of royal rule, fired by a new respect for individual freedom, majority rule, and limited government. If Hamilton made distinguished contributions in this sphere, so did Franklin, Adams, Jefferson, and Madison. In contrast, when it came to the parallel economic upheavals of the period–the industrial revolution, the expansion of global trade, the growth of banks and stock exchanges–Hamilton was an American prophet without peer. No other founding father straddled both of these revolutions–only Franklin even came close–and therein lay Hamilton’s novelty and greatness. He was the clear-eyed apostle of America’s economic future, setting forth a vision that many found enthralling, others unsettling, but that would ultimately prevail. He stood squarely on the modern side of a historical divide that seemed to separate him from other founders. Small wonder he aroused such fear and confusion. (p. A15) “Lincoln’s Greatest Case” convincingly shows that 1857 was a watershed year for the moral and political questions surrounding slavery’s expansion to the west, something that Jefferson Davis’s preferred railroad route would have facilitated. Mr. McGinty’s discussion of Lincoln’s philosophy and the career-making speeches he would develop in the late 1850s allows us to see the transportation disputes in light of the political and cultural dynamics that would lead to the Civil War. The book is also a case study of discomfort with new technology–and the futility of using a tort suit to prevent the adoption of inevitable innovation. The book ends on an elegiac note, with steamboats making their inevitable passage into the mists of history. The rails, which could operate year-round through paths determined by man, not nature, would reign supreme, thanks in part to the efforts of a technophile future president. MARGARET A. LITTLE. “BOOKSHELF; When Steam Was King; A dispute over a fiery collision pitted steamboats against railroads and the North against the South. Lincoln defended the rail.” The Wall Street Journal (Mon., Feb. 23, 2015): A15. McGinty, Brian. Lincoln’s Greatest Case: The River, the Bridge, and the Making of America. New York: Liveright Publishing Corp., 2015. (p. 256) Kenneth Button makes the case for “Really Opening Up the American Skies.” “The deregulation of the 1970s, by removing entry quantitative controls, led to a considerable increase in services. It also increased the capability of individuals to access a wider range of destinations from their homes via the hub-and-spoke system of routings that emerged. This pattern has been reversed since 2007. The largest 29 airports in the United States lost 8.8 percent of their scheduled flights between 2007 and 2012, but medium-sized airports lost 26 percent and small airports lost 21.3 percent. . . . In sum, the 1978 Airline Deregulation Act only partially liberalized the U.S. domestic airline market. One important restriction that remains is the lack of domestic competition from foreign carriers. The U.S. air traveler benefited from the country being the first mover in deregulation, and this provided lower fares and consumer-driven service attributes some 15-20 years before they were enjoyed in other markets; the analogous reforms in Europe only fully materialized after 1997. But the world has changed, and so have the demands of consumers and the business models adopted by the airlines. . . . But remaining regulations still limit the amount of competition in the market and, with this, the ability of travelers to enjoy even lower fares and a wider range of services.” Regulation, Spring 2014, pp. 40-45 http://object.cato.org/sites/cato.org/files/serials/files/regulation/2014/4/regulation-v37n1-8.pdf. Taylor, Timothy. “Recommendations for Further Reading.” Journal of Economic Perspectives 28, no. 3 (Summer 2014): 249-56. Button, Kenneth. “Really Opening up the American Skies.” Regulation 37, no. 1 (Spring 2014): 40-45.